A man has been stabbed in a Peterborough street this afternoon (Friday). Police and paramedics were called to Hargate Way, near the One Stop Shop at about 2.25pm to reports of violence. A man had been stabbed in the chest, and has been taken to hospital for further treatment. 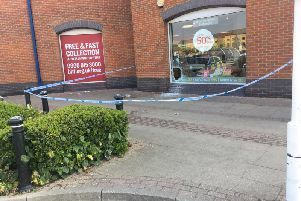 A Cambridgeshire police spokesman said: “We were called at about 2.25pm this afternoon (Friday, July 8) by the ambulance service reporting a man who had been stabbed in Hargate Way, Hampton. “The man, who is in his 20s, is conscious and breathing and has been taken to Peterborough City Hospital by paramedics. “The offender, who is described as male, about 5’ 11”, late teens to early 20s and wearing a baseball cap, shorts and a t-shirt, carrying a small ‘man bag’, is outstanding at this time. Officers are still at the scene, and part of the street has been cordoned off, including the shop. Residents were being turned away from the shop, which has been closed while investigations continue.